The moose population on the island has doubled, and without a significant wolf presence to thin the numbers, the moose could destroy the island’s plants, trees and delicate ecosystem. Every winter, Michigan Technological University wildlife ecologist and research professor Rolf Peterson trudges through heavy snow, biting winds and the thick forests of Isle Royale, a nearly undisturbed, 206-square-mile island in northwest Lake Superior. His mission is crucial to the overall health of the island, which also is a national park: He and fellow researchers check the status of the island’s unique, naturally occurring — but virtually captive — wolf pack. Once numbering as high as 50, the island has averaged 25 wolves over decades, but was down to nine as of last winter’s count. Decades of inbreeding has led to wolf defects such as heart abnormalities, low sperm counts in male wolves, less successful mating and less viable pups. The problem is obvious to researchers. What to do about it, if anything, is a tougher call. Peterson supports a genetic rescue to preserve the island’s wolves, introducing wolves from the outside to diversify the gene pool. It’s a tactic that wildlife officials in Florida used with success to save the panther population in Florida. Without a healthy wolf population, the island’s delicate ecosystem could be in danger from another burgeoning resident — moose. The moose population on the island has doubled to more than 1,000, and they are very prolific eaters, taking in 30-40 pounds of plants per day, Peterson said. This can damage the trees. Moose also spend considerable time grazing in ponds and bogs, clearing them of vegetation relied upon by small fish and amphibians, and stirring up sedimentation that also can disrupt the ecosystem, he said. Without enough wolves to keep the moose population in check, it will continue to grow until there is a “catastrophic die-off,” likely in a winter to come, he said. “Until they do that, they have a catastrophic impact on forests and the aquatic areas where they feed,” Peterson said of moose. Among the issues — and problems — the U.S. National Park Service must consider with any solution are federal laws and its own policies. 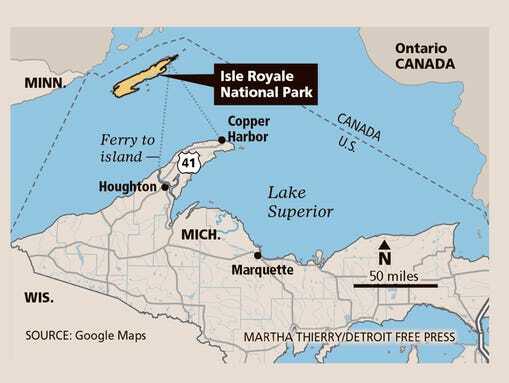 Two mandates of the service can be interpreted to contradict each other on the Isle Royale wolves: Don’t interfere with natural processes, and conserve the scenery and wildlife that exist. 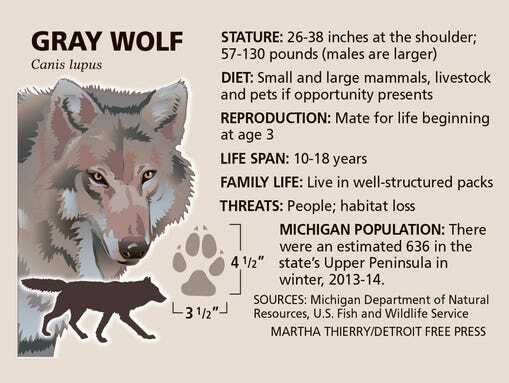 Wolves arrived on Isle Royale more than five decades ago by crossing a frozen Lake Superior in winter. And a lone male wolf that made the same trek from Ontario in 1997 proved incredibly prolific, providing a resurgence in the wolf population that lasted until about four years ago, Peterson said. During Michigan Tech’s annual winter Isle Royale surveys, Peterson especially searches for wolf cubs, evidence of successful breeding to save the dwindling pack. Increasingly, he’s disappointed. Because Isle Royale and its small surrounding islands are a national park, the park service has initiated an environmental assessment of the wolf and moose issues there. The assessment will include input from researchers, the park service and U.S. Fish and Wildlife Service staff and the public, said Liz Valencia, spokeswoman for the park service at Isle Royale. Options could include a genetic rescue, some other intervention, or “doing nothing, waiting to see if the wolf population rebounds, or if other wolves come across if there is an ice bridge,” she said. With last year’s heavy ice cover on Lake Superior, the only wolf movement on Isle Royale was a female moving off the island to the mainland. That wolf was later found dead of a pellet gun wound in Minnesota. The environmental assessment process could take up to three years, Valencia said. Where the island wolf population will stand at that point is an open question. Loss of the Isle Royale wolves would have another impact: loss of one of the most unique scientific research venues anywhere, Peterson said. “The predator-prey interaction on Isle Royale has been a centerpiece of research and a park value for over 50 years,” he said. “It’s a relatively simple system,” Peterson said. “In the winter, it’s just moose and wolves. They’re protected from harvest by people, and the habitat is protected from forest cutting. Access to the island is severely limited — and it’s surrounded by water; they can’t come and go. It makes the counts much more meaningful each year. It’s just births and deaths. There is relatively recent precedent for a genetic rescue of an apex predator at the top of nature’s food chain: the Florida panther. Once widely found throughout the southeastern U.S., hunting and loss of habitat dropped the population to about 20-25 adult cats in south Florida by 1980. Like Isle Royale’s wolves, the panther population started suffering from birth defects and poor reproduction because of inbreeding. After contentious debate, the Fish and Wildlife Service approved a genetic rescue for the Florida panther. Eight female pumas from Texas were released into the panthers’ south Florida habitat in 1995. “It was an unequivocal success,” said Stephen Williams of White Springs, Fla., president of the Florida Panther Society, a nonprofit citizens group that supported the effort. The Florida panther population has risen to about 120 adults now, he said. Subsequent scientific study confirms that genetic rescue is “a very valid thing,” Williams said. But he noted discussion, planning and implementation took years.